Let’s face it, you’ve probably never thought of having afternoon tea in Albuquerque New Mexico. So you might be surprised that one of my favorite places for afternoon tea, St. James Tearoom, is located in Albuquerque. Albuquerque is home to lots of wonderful things like the breathtaking Albuquerque International Balloon Fiesta, a rich and diverse culture, tasty chiles, a booming craft beer scene, and interesting art, but it isn’t really associated with images of folks partaking in afternoon tea. I have been to St. James Tearoom twice, once back in 2010 and again in 2016, and can say that even after having afternoon tea in locations around the world, this is still one of my favorites. 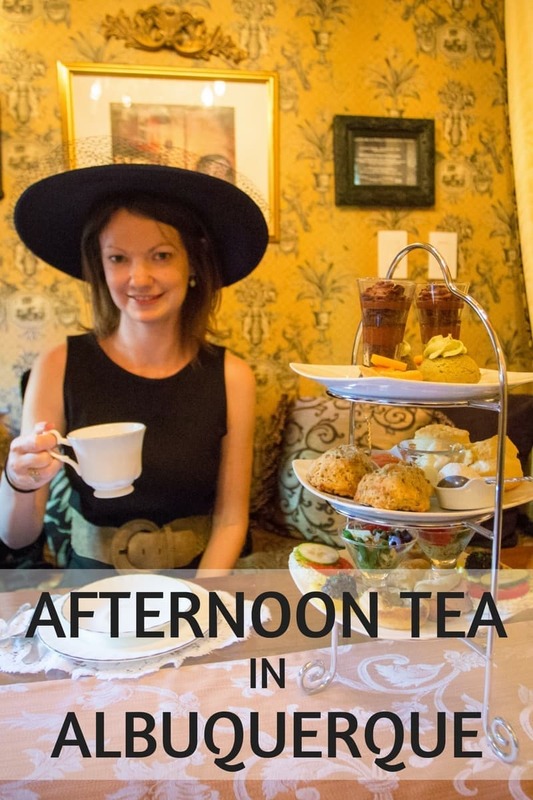 We’ll share a bit about St. James Tearoom, how you can make your own reservation, what you can expect during your tea time, and the details of our own afternoon tea experience in Albuquerque. Tea Prices (as of March 2018): Adult: $43.67; Child (age 4-10): $32.25 for the regular menus. Prices are all-inclusive and include gratuity so no tips are expected. Upgrades (add a glass of champagne) and special dietary menus (e.g., nut-free, vegetarian, gluten-free) are also available and need to be requested at least 48 hours in advance. Tipping Policy: Employees are paid “a living wage” according to the website and afternoon tea prices are all-inclusive and include gratuity. So no tip is expected or required, although you can of course leave an additional tip for exceptional service. Dress Code: There is no specific dress code although you are encouraged to dress up. Most people we saw were wearing a range from business casual to formal outfits. If you have a hat, this is the time to wear it! 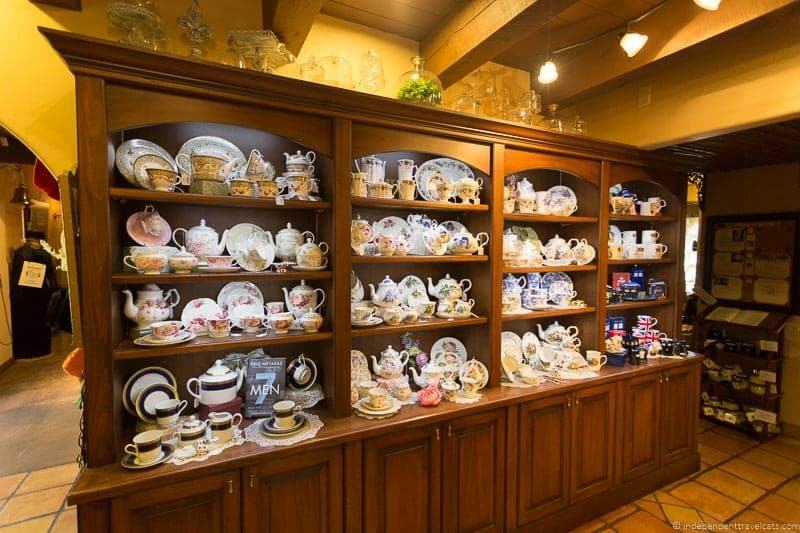 St. James Market Shops: St. James Tearoom has a large gift shop area split into different sections, selling loose leaf teas, tea china, crystal, books, gifts, hats, gloves, toys, and so much more! Hours: The store is open from 10:45am to 6:00pm Tuesday-Wednesday, 10:45am to 8:00pm Thursday-Saturday, and 10:45am to 3:30pm on Sundays. Tea times are 11:00am, 1:30pm, and 4:00pm Tuesday-Wednesday, 11:00am, 1:30pm, 4:00pm, and 6:30pm Thursday-Saturday, and 11:00am and 1:30pm on Sundays. Special hours are normally set for holidays and special events. Tea Time Lengths: Each guest is allocated 2 hours to enjoy their tea experience. Children at Tea: Note that children under 4 are not permitted for tea, and parents should consider whether or not the experience will be appropriate for their younger children. 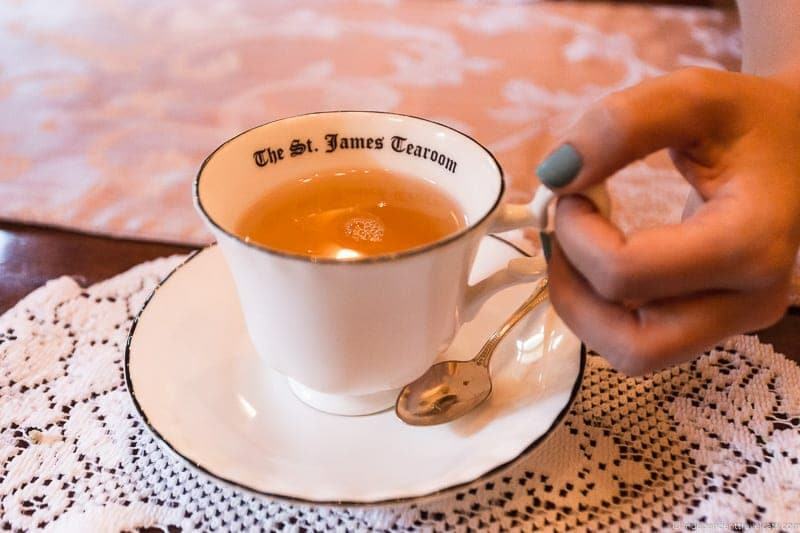 If you have children age 4-10 you can also arrange for a St. James tea nanny if you would like to have an adult-only tea while your children have tea and get taught some tea etiquette. Reservations: Tea reservations are necessary and can be made by phone (505-242-3752) or online. A credit card is required for all reservations. Note that seating requests can only be made via phone. More Information: Call them at +1 505-242-3752 or check out the tearoom’s official website. St. James Tearoom can also host events such as holiday parties, baby showers, corporate trainings, bachelorette parties, birthdays, etc. and have staff that can help organize larger events. If a better place exists for afternoon tea in New Mexico, I have not found it and I have looked hard. 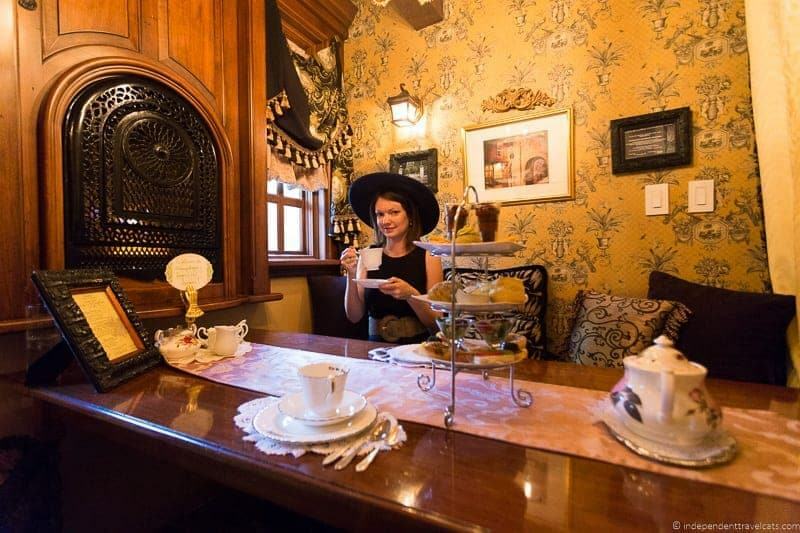 St. James Tearoom is a hidden afternoon tea gem, serving a full-service British-style afternoon tea in Albuquerque. I first came here back in Spring 2010 with my then-partner Ethan to celebrate a new job and future move to California. I was then living in Albuquerque and the tea room had just relocated to their Osuna Road location. We thought it would be a great place to celebrate and get a little dressed up as it was a place we’d wanted to go but never got around to making the reservation. You can see me in my white floppy hat with my then blond hair! 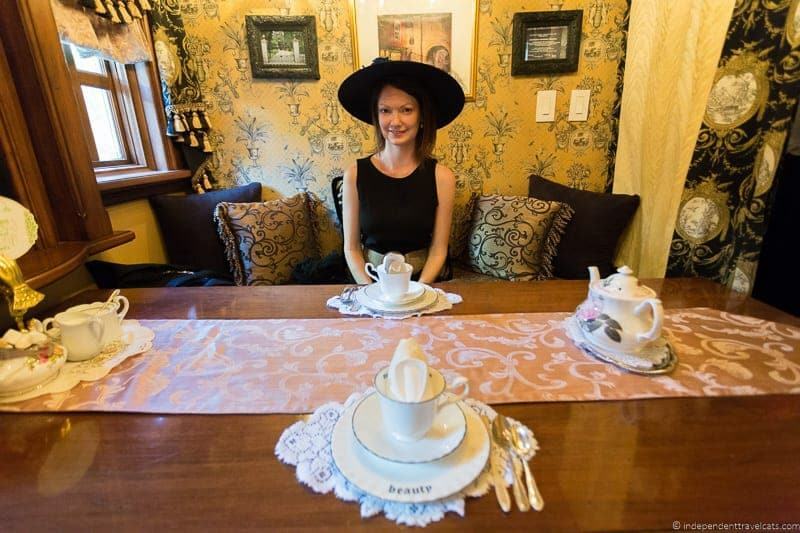 Note that if you don’t have a hat, not to worry, St. James Tearoom has several hats available that you can borrow and wear during the tea (much more selection for women than men)! I brought my own the first time but borrowed one on my second visit. 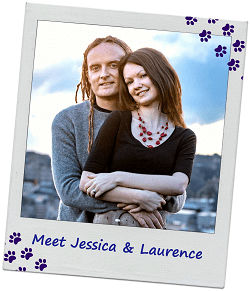 I loved my experience in 2010, and I would return with Laurence in 2016 to see if things were as I remembered them. In the space of those 5 years, I had done a lot of traveling and have sat down to a lot of afternoon teas. 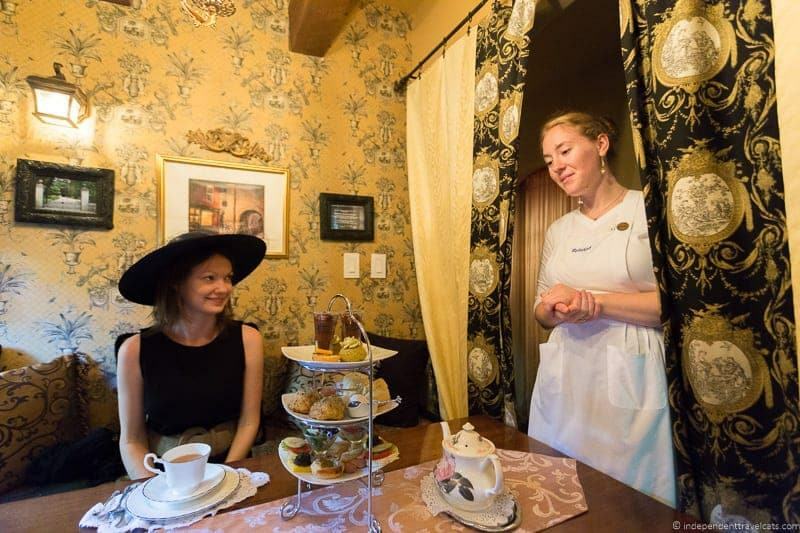 These have included afternoon teas in Paris, Cambodia, Vietnam, San Francisco, San Francisco Bay area, Chatsworth House, London, Edinburgh, the luxurious Tea Trails in Sri Lanka, on the Queen Mary 2, and even aboard the Venice Simplon-Orient-Express. I wanted to see if my memories of my afternoon tea in Albuquerque at St. James still held up after all these tea around the world. I can decidedly say that they did indeed and Laurence and I had a wonderful time at St. James Tearoom. Their secret formula? In addition to good food, tea, good atmosphere, and excellent service, they have created a lovely space and business focused only on serving afternoon tea. I think the two main things that set St. James Tearoom apart from many other places that serve afternoon tea is their focus only on afternoon tea and the layout of their dining areas. Very few places we have had tea were dedicated to serving afternoon tea. Most are served in nice hotels where the venue is used for multiple functions (e.g., meals, drinks, meetings) and the staff fulfill numerous serving roles in addition to serving afternoon tea. Other dedicated tea cafes are typically more informal settings, offering full-service teas as well as providing service to people who just wanted to stop in for a cup of tea or coffee and a pastry or a light meal. 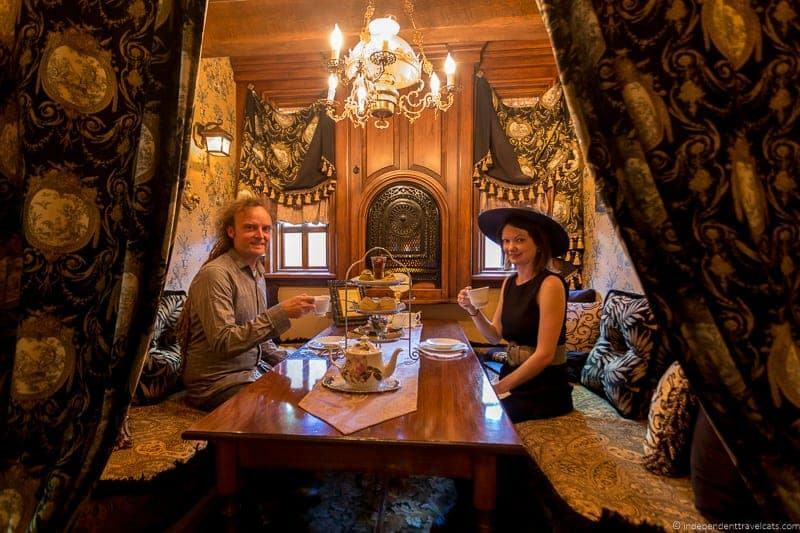 The other thing about St. James Tearoom is their layout which includes both a large open seating area (similar to most tea room set-ups) as well as private nooks. 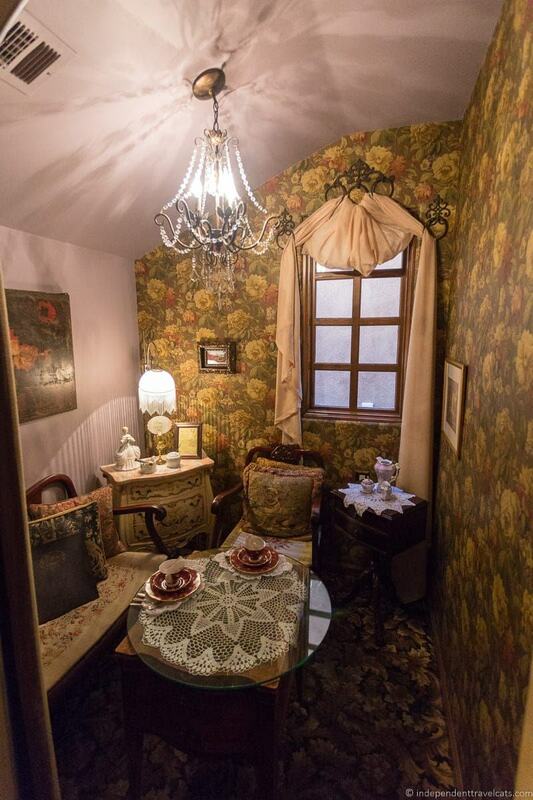 These themed nooks provide a level of privacy that is not common for afternoon teas which appeals to those looking for a more private and intimate space. One of my favorite things about St. James Tearoom is how it is decorated and the amount of privacy afforded by the curtained nooks. There is a larger library room with more open seating areas to accommodate larger groups, and smaller more private nooks for smaller groups. The library rooms can be curtained and sectioned off for smaller groups or opened up to accommodate larger groups up to 43 people. 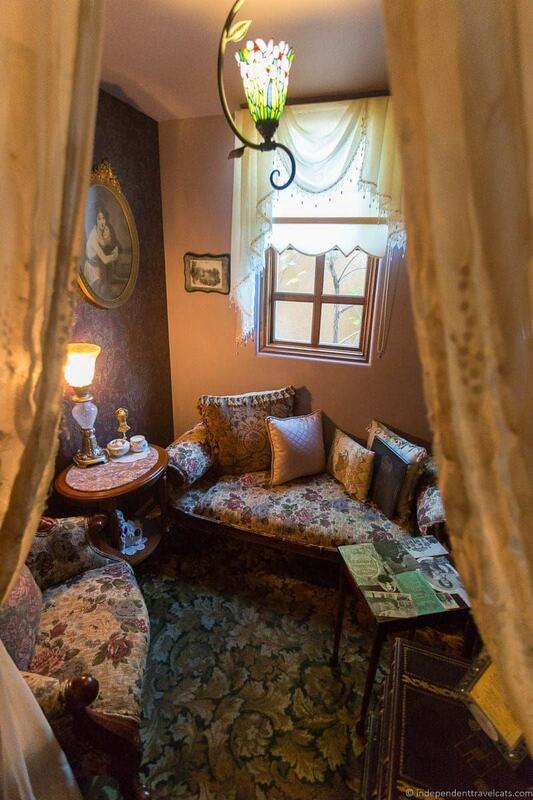 All the rooms and nooks are decorated with inspiration from the homes of famous British people like Beatrix Potter (Hill Top Farm), Gertrude Jekyll (Munstead Wood), Charles Dickens (48 Doughty Street), Sir Winston Churchill (Chartwell), and Florence Nightingale (Lea Hurst) as well as the fictional homes of characters from novels by famous writers such as Agatha Christie (Styles) and Jane Austen (Pemberley). There is even one that is themed after Captain James Cook’s ship the HMS Endeavour. Many of the areas will not surprisingly remind you of a Victorian drawing room or English grandmother’s cottage; however, several are quite masculine. You can see a couple of photos of each space online and if one particularly grabs your attention, you can request it when you book by phone. One of my favorite nooks, although I like a lot of them, is 18 Duke Street. This was the address of the London home of Isambard Kingdom Brunel who was a famous engineer, inventor, and business magnate. 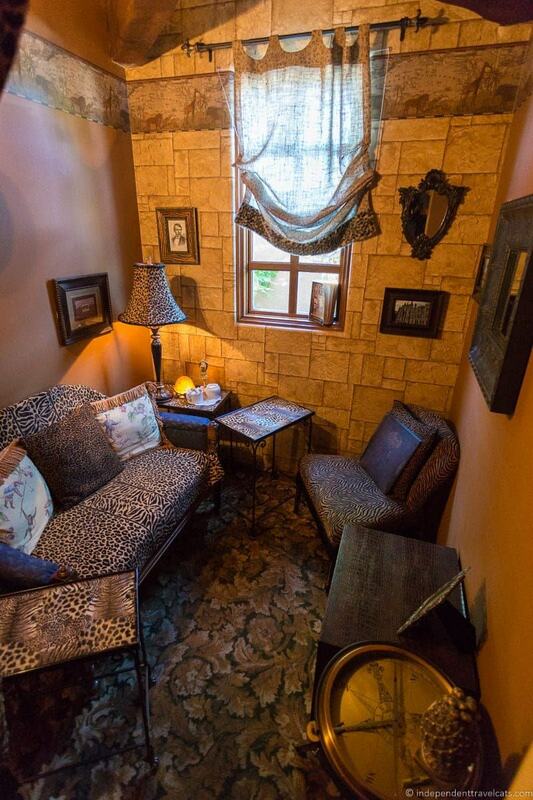 This is one of the more masculine nooks, and was perfect for taking a man and going as a couple. It seats up to 4 but we found it quite nice with just the two of us as we had lots of space. On each side of the long table are comfortable bench seats with throw pillows and curtains. Each room and nook has its own unique decorations, and a unique feature in this nook is the miniature fireplace feature with a fake fire. There were also photos and decorations on the wall related to Brunel and his home on 18 Duke Street. Black and gold curtains close to make the room private but also allow easy access for the server. 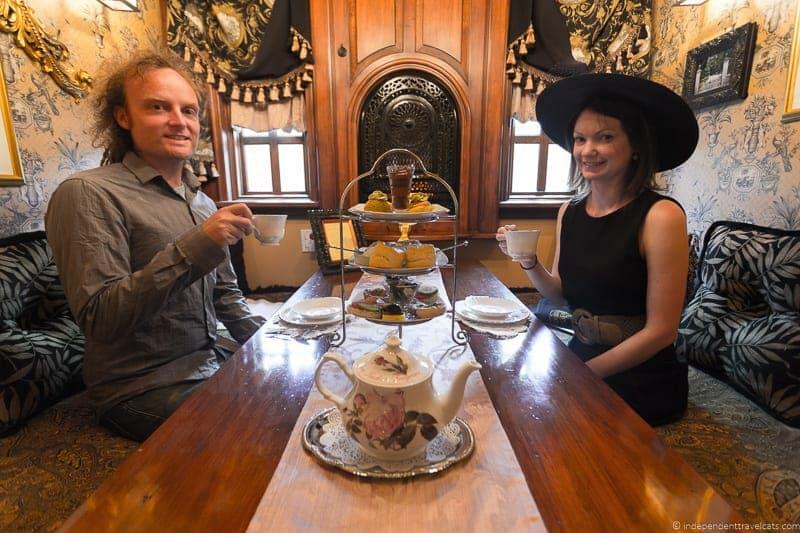 Each room also includes a printed book that includes information on the history of St. James Tearoom, etiquette of afternoon tea, proper way to make tea, and a listing of the teas at St. James Tearoom. If you don’t see this book in your area, I would ask for it as it is very interesting to look through. The menus change each month and center around a theme and the season. Often they are based on books written by famous British authors. So for instance in December, there is always a Christmas themed menu and this year it was Charles Dickens’ A Christmas Carol. The regular, children’s, and vegetarian menus are available online a month or two in advance for viewing, and you should make any special dietary requests in advance. During my two visits the themes were “Beatrix Potter: Favorites from the Lake District” and “Agatha’s Christie’s Murder on the Orient Express”. 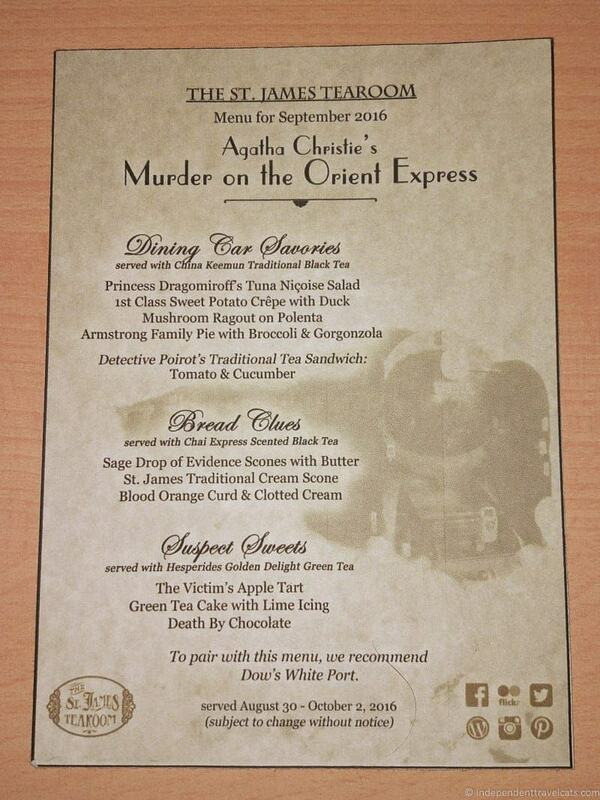 Laurence and I were both very excited about the Orient Express themed menu having read the book, watched the film, and taken the Venice Simplon-Orient-Express train. The food is served all at once on a three-tiered silver serving tray. 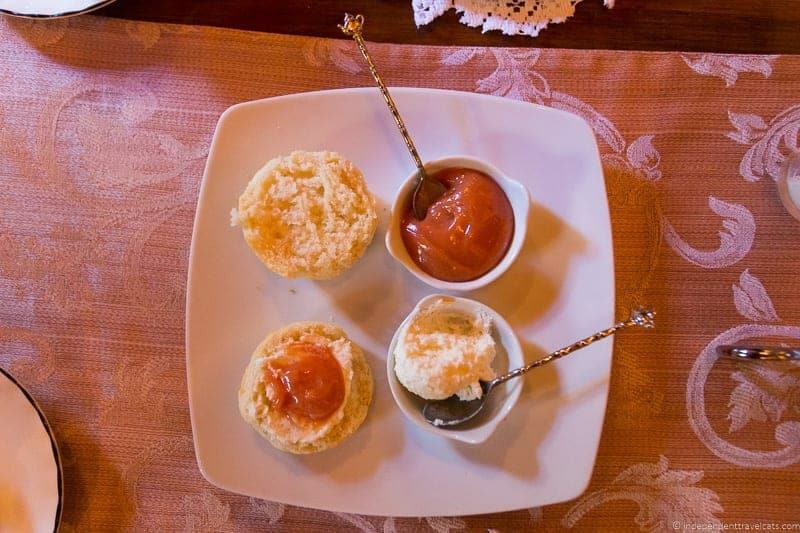 It includes a savory course with several savories and a traditional tea sandwich, tea cakes and scones with clotted cream, and a few sweet treats. Each of the three courses are accompanied by a different recommended tea and the server brings out a new teapot as you finish each one. However, there is an extensive loose leaf tea menu available and you are welcome to change the tea type or only drink one kind of tea throughout the afternoon tea if you wish. Just let your server know. The tea is unlimited during your 2-hour visit so you can drink all you wish. We found the tea and food to be wonderful at St. James Tearoom. One my first visit, I came expecting only a few tea sandwiches, a couple of scones, and maybe some cakes. Our eyes got big when the 3-tiered silver serving tray arrived filled with a variety of savories and sweets. We slowly took our time savoring each and every delicious item. I can’t say I loved every single item on both trips, but I enjoyed most of the treats and found the food to be of high quality. The tea selection is amazing and I have only tried a small number of their teas. I left full and very satisfied on both visits. I would not recommend eating in advance as it is intended to be a meal and this is equivalent to the size of a lunch for most people. 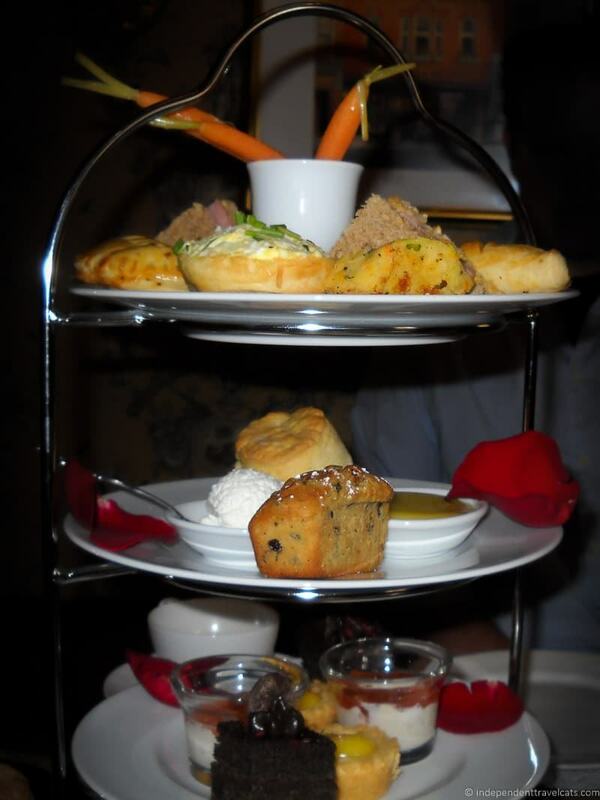 The service at St. James Tea room was excellent during my two visits. When booking, the staff has been able to help answer my questions and help book us into an appropriate spot based on our preferences. On arrival, we were warmly greeted and taken to our reserved spot. On my first visit, they were also happy to accommodate an allergy and provided an extra portion of another item for me (you do need to let them know in advance). During the tea, the staff are good at being available and checking in on customers but also being discreet and respecting guests’ privacy. For instance, they asked us to tilt or remove the teapot lid whenever we needed a new pot, which made it easy for them to check quickly rather than asking us if we needed a refill. 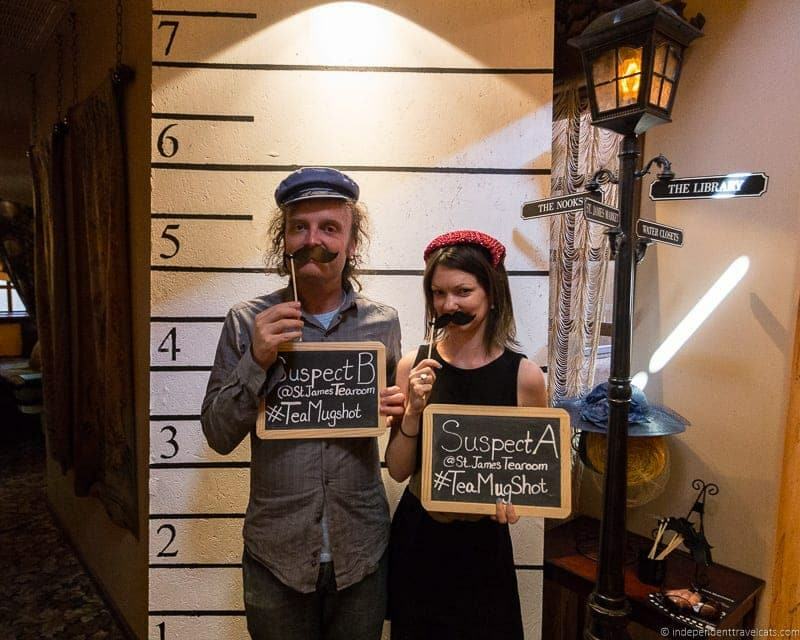 During our Orient Express themed tea the staff also readily helped take a few fun photos of us posing for our prison mugshots. We also like that the gratuity is included in the price of the tea so there is no need to worry about calculating or leaving a tip here. Coming here is like slipping into a relaxing British storybook setting for 2 hours. I honestly can’t imagine a better formal tea room in Albuquerque (or New Mexico for that matter) as this place was wonderful. It is a bit pricey for Albuquerque, but the food, tea, ambience, and service was almost faultless during our visit here. 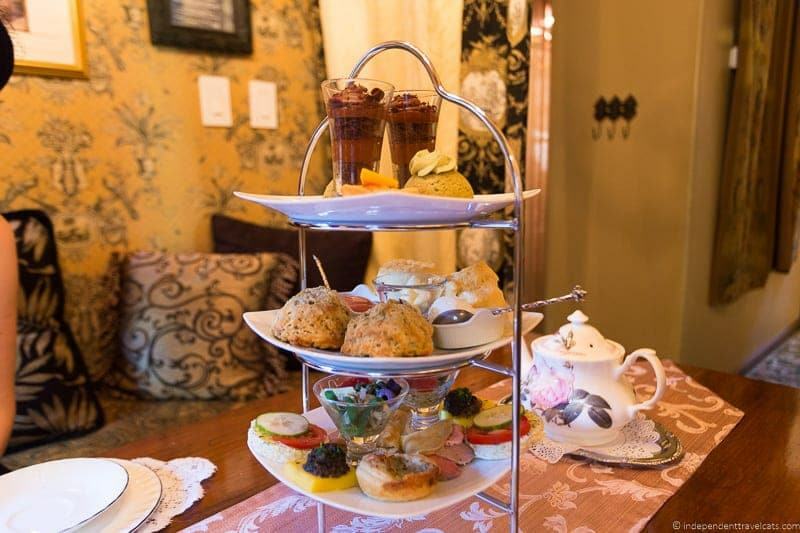 This is not the place to come if you just want a cup of tea and a scone, but it is the perfect place for those in Albuquerque wanting to escape for 2 hours and savor the full afternoon tea experience. I would definitely recommend dressing up a bit and fully getting into the occasion. A perfect place for celebrating something special or having an intimate date or girls afternoon out. A must for any tea lover in Albuquerque. So there you have it, the full rundown on our favorite place for afternoon tea in Albuquerque! 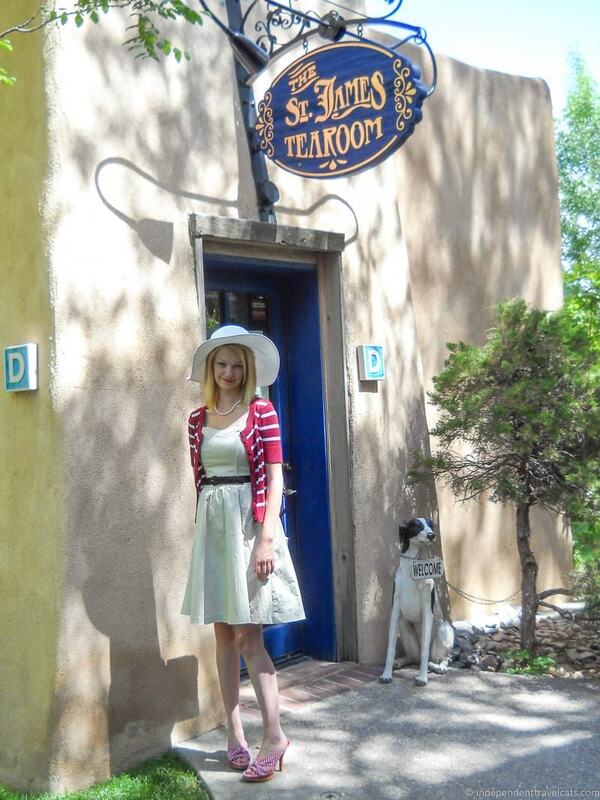 Have you ever been to St. James Tearoom or know of any other great tea spots in New Mexico? What has been your favorite place for tea elsewhere in the world? Let us know! I have always enjoyed the St. James Tearoom. It is a special place for special times. I find it interesting, in a review, that you mention the “living wage” paid to servers. This speaks of the owners’ input – there’s no way to have this information without their input. I think you’ll find, not only have the owners’ wage practices been the subject of a government inquiry in the past, they absolutely do NOT pay their kitchen staff a “living wage”. You probably should have left that part about the wages out. I enjoyed this article. I did not know about the Kung Fu Cowboy Tea House, but will try it. I will not go back to the St. James even though we’ve been going there for 16 years. Recently Tara and I were there and part of the tea were pork tenderloin sandwiches. When we asked if our waiter could substitute the pork tenderloin on Tara’s for another chicken salad which they were also serving that day, they refused. Mind you, it would have probably consisted of a tablespoon of chicken salad! Then, a few days later, I read in our local paper that the owner and her son were being sued by the Federal Government for not paying their staff minimum wage and in addition, taking a hefty portion of the wait staff’s tips for themselves.Considering the cost of a tea there these days, I would rather take the kids to a nice restaurant for the same money and better service. So the Kung Fu Cowboy Tea House is intriguing since I had nowhere else to go for tea. Hello Kay, thanks for stopping by. 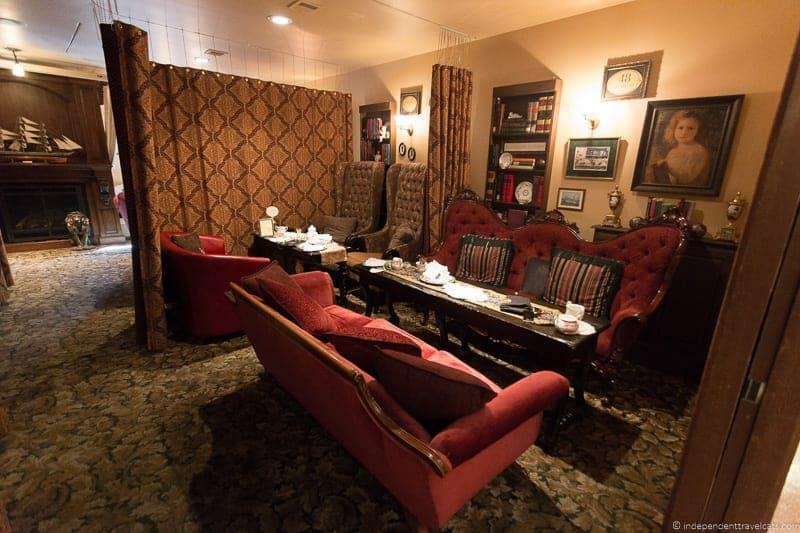 We are sorry to hear about the lawsuit against St. James Tea Room. We had a very nice time there and are sorry to hear about alleged unfair wage practices. However, I think you should definitely give the Kung Fu Cowboy Tea House Cafe a try. They have a wide tea selection and are much less expensive than St. James. I love New Mexico! It’s such a unique state! I’ve only passed through Albuquerque, but if we head that way again, I’ll be sure to check out your recommendations! They are both great places for tea! There are lots of fun things to do in New Mexico. How cute is this place? I’ve never been to New Mexico. 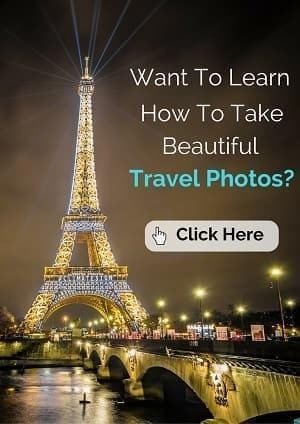 Your description makes me want to plan a trip! This looks really neat! We’re going to New Mexico in April and I’m seriously so excited… such an interesting culture! Hi Casey, where are you going in NM? I really enjoyed my year living there and Ethan I think secretly hopes we move back there again some day as he grew up there. This looks incredible! and such a cute outfit! 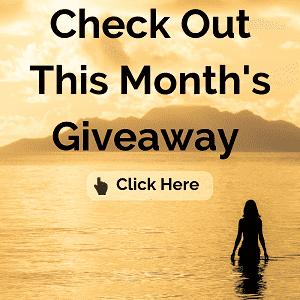 thanks for linking up with Treat Yo’ Self Thursday last week! Thanks Nicole! And thanks for hosting the weekly link-up. Gosh, I wish I would have had that information earlier! Very helpful. Ethan has been back several times since we moved but I have not, and I definitely miss it at times! I am a not a big carrot fan (the menu that month was inspired around Beatrix Potter and Peter Rabbit) but it was all so good! Hi there, great post! 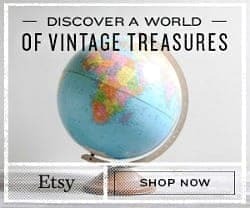 Stopping by from the Blog Hop! Now following you! Thanks for stopping by Bel. I will check our your blog as well. I know that feeling, it is so easy to not do these types of things that need reservations! There are dozens of things around San Francisco we have been wanting to do for the past 3 years…. 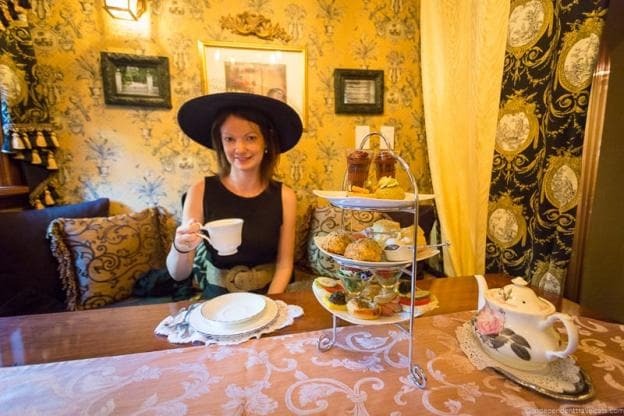 The St. James Tea Room looks like a classy place & I love that you wore a floppy hat. After coming back from South Africa and having a bunch of lovely teas (with loads of desserts and sandwiches), I came back to the States craving something like this. Sadly, I live in a small town that doesn’t have a tea room, but it was fun reading about your experiences. New Mexico is one of my top travel destinations in the U.S., and I will keep these places in mind. Thanks for sharing! Ah, I have heard of some lovely places for British-style tea in South Africa. I would love to do that some day.! If you head to NM, feel free to get in touch. Ethan is from there and I lived there for over a year. I highly recommend trying to visit during the Balloon Fiesta in October, it is more busy but the festival is breathtaking. Love the name of the second cafe! Afternoon tea is definitely an experience worth having. The interior of the St James tearoom is brilliant, it does look like another world. Haha, yes, Kung Fu Cowboy Tea House Cafe is quite the mouthful! I love afternoon tea! It feels so indulgent. I’ve only ever been to Albuquerque briefly on road trips, but next time I’m in the area, I’ll make a point of checking out one of the tea rooms for afternoon tea! Thanks! St. James is really wonderful. It was so much better than we had expected. I’ve never been to New Mexico, but I loved traveling there vicariously through this post. 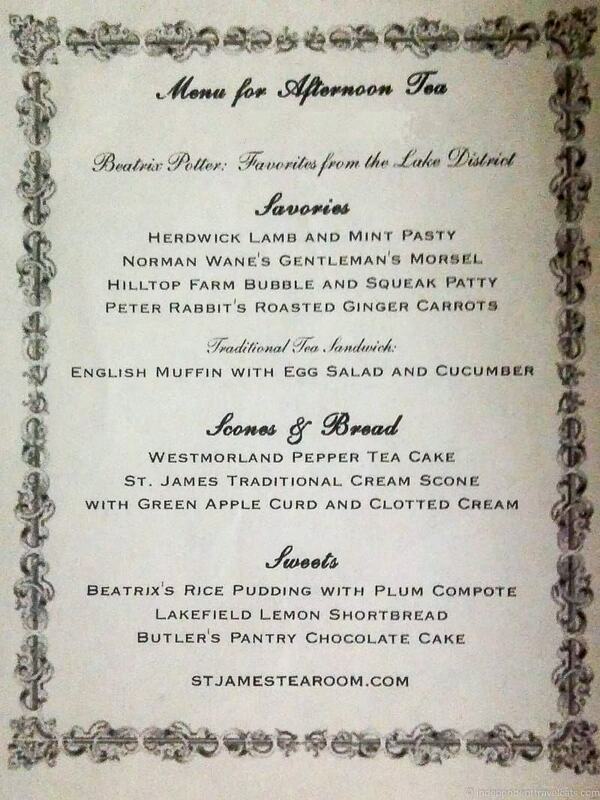 The St. James Tea Room looks lovely – how fun! I’ve been to a tea room in my town once before, but it can’t hold a candle to where you went. Thanks for sharing! Thanks for stopping by Dana! New Mexico is a fun place to visit, especially for the art, history, and all the great outdoor activities. It also happens to be home to a fabulous tea room!